Very Good. Very Good condition. Audio CD. Case Good. Booklet Very Good. 2 disc set. BMG edition. Quality guaranteed! In original artwork/packaging unless otherwise noted. Good. Good condition. Audio CD. Disc slightly scratched. Case Very Good. 2 disc set. Quality guaranteed! In original artwork/packaging unless otherwise noted. Antonio Vivaldi. Very Good. In very good packaging. Hogwood/Marriner/Kipnis/Kulka/Pickett-Vi Adagios by Hogwood/Marriner/Kipnis/Kulka/Pickett. New. SEALED in the shrink wrap! BB5788. FAST shipping, FREE delivery confirmation and online tracking. Thank you! I bought this double cd for my mother who loves classical music. 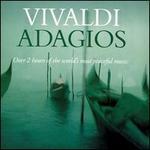 She has the whole Vivaldi collection of music & was very impressed with this selection! I transferred the cds to her e-book reader as she enjoys reading & listening to music at night. She recommends it to anybody who loves classical music & who wants a restful night's sleep after listening to it.